John Sanday is a British architect who has spent the last 36 years living and working in Nepal. As one of the leading architectural conservators in Asia, he has travelled and worked all over the sub-continent on a wide assortment of historic buildings: monasteries in the high Himalaya, Palaces in India, and since 1989 in the monuments of Angkor, Cambodia. JSA was engaged until 2014 to support the architectural and engineering reconstruction of Chhairo Gompa. JSA undertook design and supervision of the works, employing local labourers and Nepali craftsmen from Kathmandu. This contribution to the Chhairo website is from Rachel Kellett. Rachel is a freelance writer who wrote Sugata his life story “Bird of Passage” with him. I first came to Nepal and Chhairo because of Sugata. Beginnings and endings, moments when our history accelerates, turning on a new trajectory as we think we are walking straight on. Tracing the threads back, I met Sugata in India. Budhgaya. At a meditation retreat, my first, and his first after a time of secular living. I fell in love with his life story, and together we began to write it, unravelling the second part, the ‘monk’ part, together in his hut on a mountain in Norway, his adopted homeland. For his 90th birthday, we went to Nepal, to trek the Kali Gandaki and see Chhairo. Sugata first came to Nepal in 1954, and to these mountains in 1960; in writing his life story, we were remembering and re-living these times. Surprisingly we ended up adding to the story, tying up a 1960 loose end. In 1954 Sugata travelled overland from Sweden, then his home, to India and from there to Nepal where he became a Buddhist monk of the Theravada tradition under Amrit Ananda, in Ananda Kuti, Swayambhunath, Kathmandu. He was as much an object of interest then being the only white skinned monk, as he was when he returned to the mountains with me in 2001 aged 90. Already a monk with a difference, he had a further trademark of 3 Leica cameras hanging around his neck, and because of this attracted the attention of a certain Sham Sherchan, a merchant from Tukuche who invited this convenient combination of monk and photographer to accompany him in up to Tukuche to photograph what is sometimes called ‘Devil Dancing’ or more correctly Sha Na, or Black Hat. These were Buddhist celebrations that took place every year to re-enact, with elaborate dance and dramatic masks, the victory of good over evil. In November 1960 Sugata travelled with Sham Sherchan from Pokhara to Tukuche, part in a bamboo basket on the back of a porter (he was recovering from blood poisoning in his leg), part on a mule, (that died in Ulleri) and finally on foot. It took 3 months there and back. Sugata arrived at Chhairo from Tukuche. He took photographs of the ornate brass and the elegantly carved wooden Buddha figures along with the magnificent thanka wall paintings. It must have been soon after his visit that all the buddha statues that could be carried away were stolen. When he came again in 1979 the empty Gompa was guarded ‘after the horse had bolted’ by Gorkha soldiers. Back in 2001, just after Marpha on our way down from Jomson, we crossed the bridge to the Tibetan Refugee camp in Chhairo where an unusual grove of tall evergreen deodar trees gave shade and protection from the wind whipping up the Kali Gandaki (as it does) to an isolated settlement of 200 Tibetan refugees, and a substantial and old walled Gompa. The wall paintings had all but disappeared due to rain running down the walls from the leaking roof. Only the fixed clay Buddha figures remained. In their faded glory they were still impressive, perhaps even more so, humanly worn as we all are with age. Particularly impressive was the giant painted clay image of Padmasambhava, broken but still firmly holding the heads of greed, hate, delusion – still overcoming. In the end the photographs commissioned by Sham Sharchan in 1960 were not used – the lamas did not want to publicise their ceremonies and, like the masks, the hundreds of photographs and slides lay in Sugata’s boxes these many years. Until 2001. When we came down from the mountain a series of events led us to have dinner with Shashi Dhoj Tulachan, a thangka artist, on our last evening in Kathmandu. 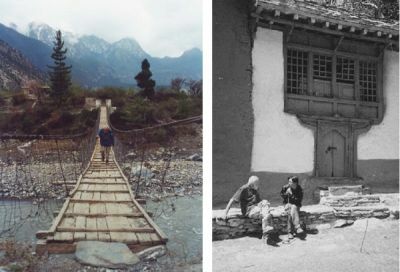 Over an extraordinary dinner he told us that with a committee (the Kali Gandaki Foundation Trust) he was raising funds to restore the Chhairo Gompa, and yes, definitely the 1960 photographs would be extremely useful for the restoration work. It took a circuitous and fascinating route, every turn of which was a surprising adventure, to get to Shashi. We had to meet Patrick and Purna in Tukuche who first mentioned Shashi Dhoj Tulachan’s interest in restoring the Gompa. We had to meet Bhuwan in Dhaulagiri lodge, Tatopani, and talk to him about the Sham Sherchan family; Bhuwan had to meet the widow of Sham Sherchan at a wedding in Pokara and mention Sugata’s travels with her husband in 1960; Mrs Sham Sherchan had to be so interested to meet us she returned a day early from another wedding in Pokhara and when we met her she had to be immediately decisive enough to telephone Shashi Dhoj Tulachan. Shashi, without knowing anything about us, said we should meet immediately. ‘When I came up to Tukuche I visited a thanka artist. He had two houses, one he used exclusively to paint in and it was little way from his family house to give him isolation and concentration. I took a photograph of him and another of him with his son, who was just beginning to learn this old tradition. In the courtyard was a hen, and I asked if it was the hen that provided the yolk for the tempera. ‘Yes’ said the man, and I took a photograph of the hen as well. Shashi’s face became more and more incredulous and finally bust in laughter. ‘I am that son,’ he finally said. The exhibition of Sugata’s photographs in Patan Museum (Kathmandu) was a success and revelation: daughters and sons of the some of the people in the photographs exclaimed as they recognised their family or even themselves. We raised some modest funds for Chhairo. We launched the book published with Mandala (Kathmandu), and sold it out. Sugata rounded his life in the way he wanted to, and shared his story with us all. Sugata did not ever return to Nepal. He died in 2007 at home in Norway.